In case you didn’t know, blocked tear ducts are incredibly common. Some of the symptoms you’ll want to look out for include: excessive tearing, eyelid crusting, blurred vision, pus or mucus discharge from lids and surface of the eye, painful swelling near the inside corner of the eye, redness of the white part of the eye, and frequent eye infection or inflammation. Of course, you don’t want to leave any health issue to a self-diagnosis. Seeing a professional as soon as possible goes a long way toward preventing things from getting worse. So when should one see a doctor about this? If the blocked tear duct continues for several days, then it’s definitely time. Some of the common causes of blocked ducts include: age-related changes, injury or trauma, a tumor, congenital blockage, cancer treatments, and eye drops. Get your eyes back in tip-top condition. Whether you want more information or if you want care as soon as possible, feel free to contact ChristianneSchoedel. 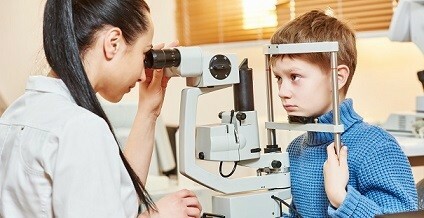 Visit her location soon and get your kiddos treated to first-rate children’s optometry in Hershey. Sound good? Our patients certainly think so. Don’t struggle with blocked tear ducts any longer. Take the first step toward health. All you have to do is phone ChristianneSchoedel. Or shoot her staff an e-mail. Her staff will promptly help schedule an appointment. And then? You’ll only be moments away from visiting her office for children’s optometry in Hershey. That’s really all there is to it.